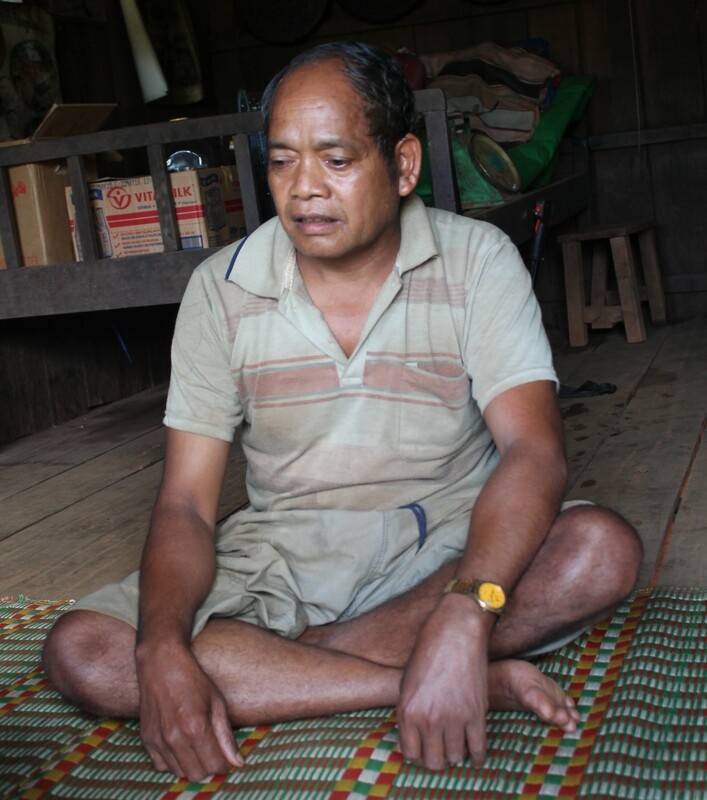 My name is Srom Chrat, I am a 51-year-old Bunong man. I am living in Puham village, Senmonorom commune, O Raing district, Mondulkiri province. I was born in this village and married a wife here. This village is located around 25km from Senmonorom buffalo roundabout, the capital of Modulkiri province. I can tell you stories about elephants and other animals such as cow, buffalo, banteng, rhino, people and other animals living in this region. Today, I would like to tell a story about elephants; it comes from Bunong elder people of this village and told in Bunong language. Once upon a time, a long time ago, there was an orphan boy whose parents died. He lived with his old grandmother. They earned their livings in the traditional way such as farming and collecting the non timber forest products (collecting rattan stems and vegetables from the forest). One day, the orphan boy went with a group of adults (men and women) and kids of his village to collect the rattan stems and vegetables in the forest. When they got to the thick forest with many big trees and a variety of vegetables, they started collecting rattan stems and vegetables. Unluckily, they touched an itchy plant and it started itch their whole body while they were collecting the vegetables. When they felt too much itchy, they used their hand to scratch it and helped each other doing so. After they got too itchy, they went back home. The dark came but their itching was not getting any better even though they tried to treat it and took a bath and cleaned it with warm water. They couldn’t get rid of it and even when they tried to treat it by medicinal plants. Because their whole body was more and more itching, they scratched it more and more frequently; it caused their skin to harden and it got as thick as the elephant skin. They couldn’t use their hands and feet like they did before because they became too hard. They could only use their mouth to eat the rice. One day, a man named Ta Nhot called the elephant people to help him carrying the thatch to cover this house roof. He said “I am asking your help because my house leaks when it rains”. The elephant people asked “where is your thatch?” He responded “they are in my farm.” Ta Nhot and the elephant people built a cart to transport the thatch. But the cart was too big and too heavy for the elephant people to transport. The elephant people mumbled and complained. Ta Nhot immediately replied “why do you complain like this, you have a big body. Since that time, the elephant people worked every day and didn’t have time to rest. 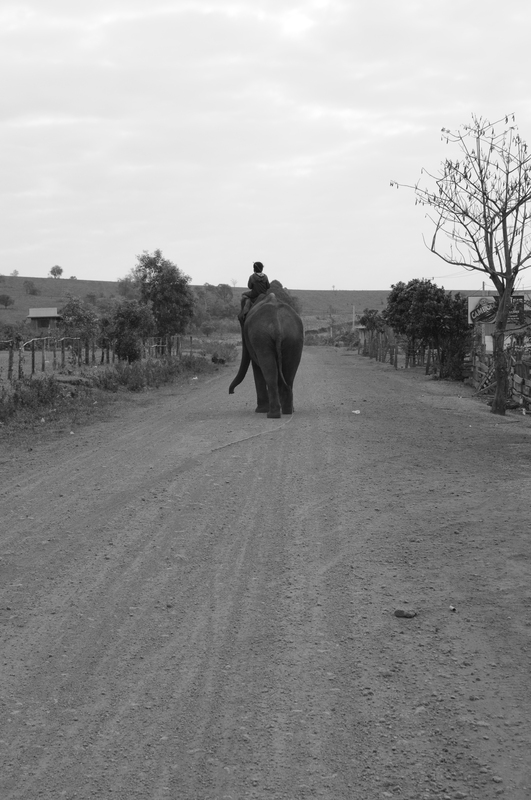 Another day, Ta Nhot called the elephant people to transport wooden accessories for the house. Elephant people started to complain about Ta Nhot; Ta Nhot, he threw pestles into their mouths. After that the elephant people couldn’t speak because their tongue direction was reversed: the end of their tongue was pushed down into their throat and the base of their tongue came to the front of the mouth. Thus the people became elephants and couldn’t speak people language anymore. They had no choice but to stay and work hard for Ta Nhot. When elephants work hard, they get tired so they will breathe in and out by heading up their head because their tongue became different from people’s tongue. It is a reality: elephants’ ancestry is a human being. That’s why Bunong people respect elephants and do not mistreat them; as an example, we couldn’t eat elephant meat. Moreover, we don’t hunt or kill elephants because the perpetrator will receive their sin in a near future. We burry the body of elephants when they die; we celebrate the same funeral ceremony as we do for the people. We have three times taboos or mournings- firstly, when the body is buried; secondly, when the mourning ceremony for 7 days of dead and the last one is the mourning ceremony for 100 days of dead. We strongly believe that this story is true. That’s why I want to tell this story and let everyone know and understand. To my opinion, I think it is a great opportunity for me that these Bunong stories are collected by this NGO; it helps preserve and make the culture and tradition of Bunong people alive for the young generation. The young people can learn and share this knowledge; thus, deeply contributing in preserving their culture and tradition. The culture would be lost in the future if the young generation doesn’t pay attention and take part in its preservation. For example, even myself cannot tell you these stories as clearly as our ancestors or older generation. So I would like to suggest, call and encourage the young people to contribute in protecting and preserving the Bunong culture and tradition. I think that it is a good job to help promoting the Bunong civilization, identities and traditions. I am so regretful that our Bunong culture and tradition were forbidden during the 3-year (Khmer Rouge) era. It ruined everything. We feel better now because we are allowed to practice, protect and re-preserve our civilization. We don’t discriminate – racism and color- Everyone is free to either believe in Buddha or animism, it is their freedom to believe. I think that all the religions are good because they educate people in good ways. I thank you and your organization so much for interviewing me and compiling and documenting these Bunong history. The young generation can learn from it. This entry was posted in Bunong Stories and tagged animism, bamboo tree, Bunong, Bunong story, culture, elephant, forest, gods, indigenous, mondulkiri, O Raing, Puham, spirit. Bookmark the permalink.